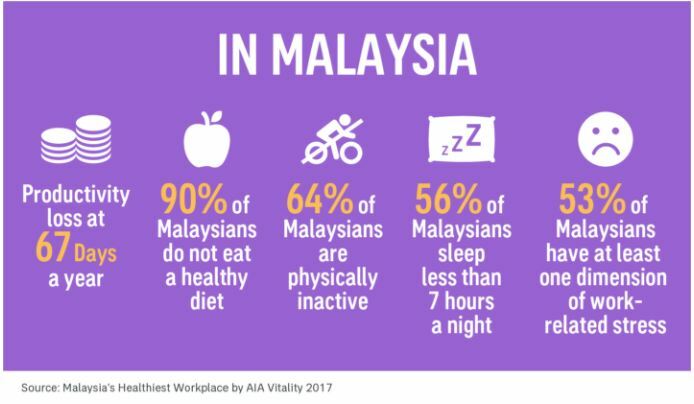 According to findings from the Healthiest Workplace by AIA Vitality Survey 2017 for Malaysia, obesity is increasingly a problem in Malaysia with 12.5% of Malaysian employees to be obese. 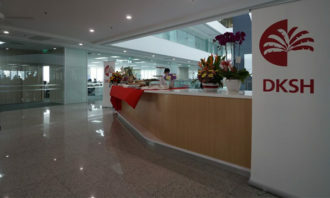 Of those who recalled their medical result, 46% of Malaysian employees are at risk of high blood pressure and 10% are at risk of high cholesterol. Additionally, 29% of Malaysian employees are at risk of having one or more chronic conditions – such as a heart or kidney condition, cancer, diabetes, or high blood pressure. Meanwhile, 84% of Malaysian employees reported at least one type of musculoskeletal condition, but fewer (50%) reported two or more. Not only do Malaysians suffer from obesity, the survey revealed some real concerns about stress in the workplace and issues surrounding sleep patterns. In fact, 56% of Malaysian employees sleep less than seven hours a night, with more than half (67%) reporting poor quality of sleep. 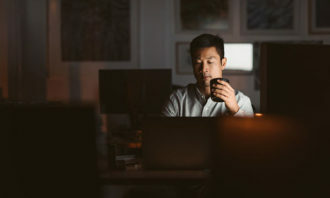 According to the survey, Malaysian employees also work the longest hours among the markets surveyed – on average 15 hours more than their contracted hours each week. When it comes to taking breaks during the work day, 17% of Malaysian employees can’t decide when to take a break. 53% of employees in Malaysia reported at least one dimension of work-related stress, compared to 43% in Singapore, 64% in Hong Kong, and approximately half of Australians. Aside from work, 20% of Malaysian employees report ‘a lot’ of financial concerns – hinting that financial concerns are an issue in the country. Meanwhile, the report stated that 18% of employees in Malaysia reporting cited being exposed to bullying at work, and 4% of Malaysian employees reporting that they are bullied ‘often or always’. Additionally, 12% of Malaysian employees experience high levels of anxiety or depressive symptoms. According to the report, physical inactivity is an issue in Malaysia where nearly 64% of employees do less than 150 minutes of physical activity a week – the highest percentage compared to Singapore, Hong Kong and Australia. Most employees are sedentary throughout most of their working hours. As for when it comes to diet and nutrition, 90% of surveyed Malaysians employees do not eat a balanced diet. Their diets are poorest in fruits and vegetables with 86% of Malaysians eating fewer than five servings of fruit and vegetables each day. When it comes to productivity, it can be linked to the employee health and well-being through two measures – absence and presenteeism. In the survey employers experience a total of 67 days per employee per year were lost, primarily to presenteeism (lost productivity from employees who show up to work despite health and morale issues), which accounted for 58.8 days per year. Additionally, the survey revealed absenteeism accounting for 8.2 days. On the bright side, more than half (53%) of Malaysian employees feel their line managers care about their health and wellbeing. In fact, 54% feel their leaders view employee health and wellbeing an important part of their organisation’s success, and 60% feel their line managers encourage them at work. 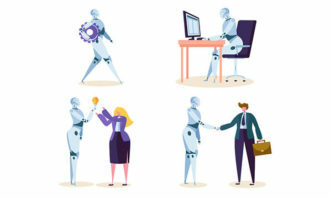 To support their employees, 91% of bosses offer at least one workplace intervention, while 58% of employees participate in at least one intervention at work. However, on average only 14% of employees are aware of the interventions on offer. 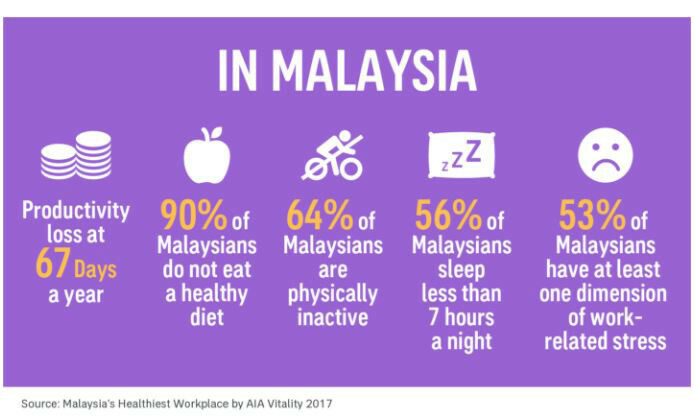 Malaysia saw the greatest number of employers participating in the Healthiest Workplace by AIA Vitality Survey 2017, the results were polled from 5,369 employees across 47 organisations in urban areas.